The younger children did not go everywhere on Campus but one place I let them explore was the Music Room. With names like Quincy Jones, Melody, and Dominic, I had to bring them around the piano and drums. When we got there, they fell right into their zone. While Quincy Jones was playing the drums the rest of them were banging keys on the baby grand. When I told them it was time to go, they all placed fingers over their mouths, and creeped out of the music room in one straight line. Then, Dominic stopped and said, wait, where are the teachers? Shhh! We can’t disturb the students, another one whispered back!! Meanwhile, they all looked at me with curious eyes, beginning to wonder about the same thing. I kept my eyes straight and crept them back outside. To which they forgot to ask for the the teachers again. Ms. Richardson and her beautiful daughter Priscilla on Eddies Parade. Ms. Richardson a parent who volunteered with the center this year. She came in faithfully twice or three times a week to lead the art class. Here we are! We are sitting on the steps where I was given my college diploma a couple of years ago. 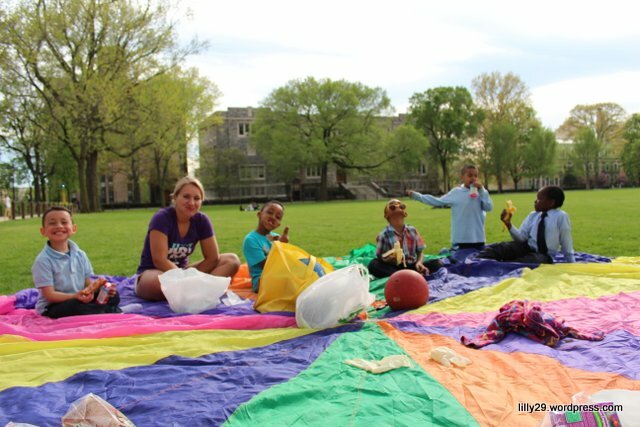 Almost the entire after school program, staff and children, left the center to tour Fordham’s lovely campus. The children were E-C-S-T-A-T-I-C. 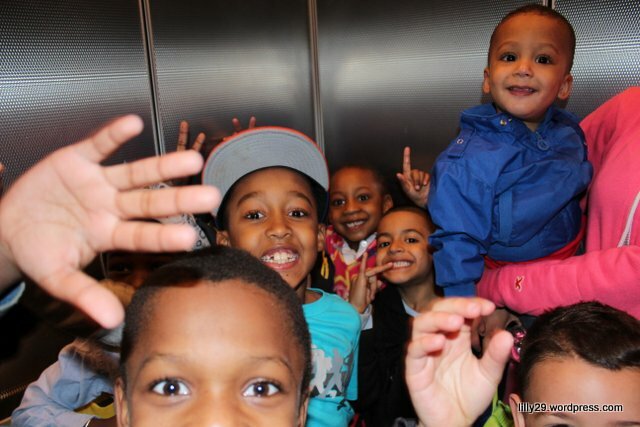 The older children wanted to know if it was going to be a fun trip and the young kids just wanted to play. I was worried something crazy was going to happen but when we got there, everything worked out for the good. Two Fordham students (and Mary Mitchell volunteers), Erin and Nia, met us at the main gate. We split the children into groups by age. They trekked all over campus. The pool, the library, the church, the cafe, the music room, the basketball court, the baseball field, Eddie’s parade, and finally the dorms. Every where they went, they were mesmerized by the college life. The students, the band practicing, the ‘big buff guy playing frisbee’ , ‘the girl with the Pumas’, the art on the wall, the grass and trees, the flags, the banners, the lights, the long hallways, the water fountains, the kitchen area, even the bushes. And, Fordham’s lovely students embraced them. The older kids walked away saying, I played frisbee with the college students!! The girls are nice, they taught me how to do splits and flips!! The younger kids walked away saying, I was a whale on the lawn and got to gobble up everything then, I went into the castle and drank water from the water fountain! I walked away simply exhausted. At the end of the trip, everyone declared that they wanted to go to college. Even staff wanted to attend Fordham. I was happy to see Rebel Diaz at the concert. It brought back fun memories from my days at Fordham! My friend Stacy came to church last Sunday. We had a great time together. I can’t wait for her to come again. In the picture: Stacy, Torria and of course, Me. The happy children are now visiting the dorms. Yep, even little John wants to see what it’s like to live on a college campus. Higher learning for all! 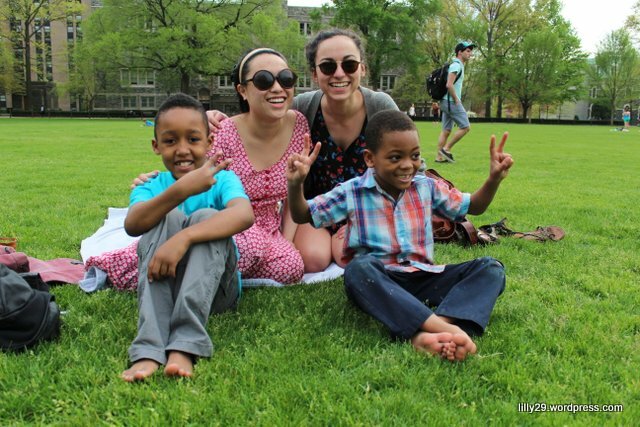 Last month I took my kids to Fordham University to see what college is really like. They had so much fun, they all said they couldn’t wait to go to college.